At DBW, we can build you up a set of wheels based on your intended use and your budget. 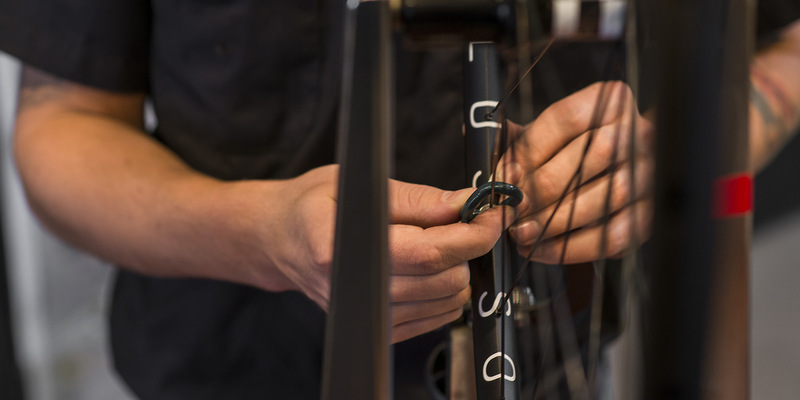 We have relationships with, and access to many of the top wheel brands in the bicycle industry. We also offer one-on-one sessions if you are interested in learning how to maintain your own wheels and carry the necessary tools you will need. This true is also called "rim run-out", and is the side-to-side wobble of the rim as the wheel spins. This aspect is the most critical to brake caliper settings. This is the amount of up and down wobble. If the wheel becomes out-of-round, it wobbles up and down with each revolution. In severe cases this will affect brake pad placement and can be felt by the rider as a bump every wheel revolution. This refers to the rim being centered in the frame. If the rim is offset in the frame to either side it may be difficult to adjust the brakes. Severe cases of poor centering can also cause handling problems, because the rear wheel will not track behind the front wheel. This is simply the tightness of the spokes. Spokes are tensioned just like other fasteners. Spoke tension is best measured using a tool called a spoke tension meter.